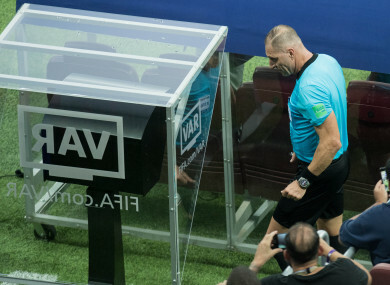 Referee Nestor Pitana walks to the VAR Monitor during the World Cup final. NO MATTER HOW sophisticated the technology and regardless of the competency of the officiating, there will always be hotly disputed decisions in football. Last week’s World Cup final was a good example of the subjective nature of certain decisions. The Ivan Perisic handball that was eventually awarded as a penalty divided fans and pundits alike. Judging by the reaction on social media, roughly 50% of people felt it was the correct call and everyone else thought otherwise. You will always get people who interpret the rules differently, so irrespective of how many times an official watches an incident back, there is a good chance he won’t satisfy everyone. The fact that not every decision is black and white is one of the main arguments put forward by people not in favour of the Video Assistant Referee (VAR). It is hard to argue with this suggestion and it is also true that despite the presence of VAR, human error can still prevent justice from being done. At the World Cup, Iran, to cite a specific example, were hampered by at least one poor decision. In their 1-1 draw with Portugal, most people agreed that Cristiano Ronaldo should have seen red rather than yellow, after he caught Morteza Pouraliganji with a flailing arm in an off-the-ball incident. “In the rules, an elbow is a red card, it doesn’t matter if it’s Lionel Messi or Ronaldo,” Iran boss Carlos Queiroz said afterwards. “There is no way on earth that is deliberate handball. It turns the game into an absolute farce,” BBC pundit Alan Shearer said of Iran’s penalty. The RTÉ pundits were similarly unimpressed. “Because Iran had suffered a couple of injustices, they said to give the [last-minute] penalty,” Liam Brady argued. “The reason it was brought in in football was to get the right result and the fair result — that is the biggest myth in football because it only takes one decision to get wrong and you don’t get the fair result,” added ex-Liverpool midfielder Didi Hamann. It was not the only game to provoke controversy. When and how often a referee chooses to consult VAR has been a subject of debate, with critics arguing that is slows the game down too much and makes football borderline unwatchable on occasion. Serbia lost a pivotal group game against Switzerland with a big call going against them. With the score 1-1, Aleksandar Mitrovic was wrestled away from a cross by two Swiss defenders. It was a blatant penalty, yet the referee chose to ignore protests and Switzerland ended up winning 2-1 and going through to the round of 16 at the Serbs’ expense. There is no doubt that there have been a number of teething problems. Perhaps, rather than leaving it up to the whim of the officials, a tennis-style system should be imposed, whereby both teams get three opportunities to call on VAR. Yet while the contentious decisions prompted by this new initiative will inevitably be highlighted, discussed at length and used by naysayers as supposed proof of its inadequacy, the unequivocally correct calls it facilitates are unlikely to attract as much attention. There were many instances in this World Cup in which justice was undoubtedly served as a result of the available technology. France’s first goal against Australia, for instance, or the opener in South Korea’s famous win over Germany (see below). Another of the main arguments against VAR is that it would lead to too many boring stop-start games, but Russia 2018 has been widely regarded as one of the most entertaining World Cups in recent memory. The system’s impact has also been obvious. 43% or 73 of the goals were scored from set pieces — more than in any previous tournament since 1966. Part of the reason for this outcome is surely due to officials clamping down on jersey tugging and being willing to review the incident in question if necessary. There were also 22 penalties awarded, which is more than any World Cup in history. Seemingly, officials felt more confident awarding spot kicks in the knowledge that they could review the decision if necessary. Consequently, whether you agree with it or not, there is no doubt that VAR had a considerable influence on the tournament. Fifa referees committee chairman Pierluigi Collina was among those to adjudge it a success, saying he was “pleased” with VAR’s impact. Yet despite some vocal supporters, the football world in general seemingly remains reluctant to embrace this change. Last April, Premier League clubs voted by a two-thirds majority to defer the implementation of VAR for the coming season, a decision that was lamented by Arsene Wenger among others. “I think the Premier League has voted against VAR and it is upsetting. It destroys me because we were in front of the rest of the world, and now we want to be behind,” the former Arsenal boss said. It seems hard not to sympathise with Wenger — while he has always been perceived as forward-thinking and enlightened, the same cannot be said of English football at large, and this development is perhaps the latest example of the game’s traditionalists halting progress. Granted, VAR is by no means perfect, but there is surely much to be gained from it — while it does not guarantee justice will be served, it certainly decreases the likelihood of Thierry-Henry-handball-type incidents, in which blatant cheating is effectively rewarded. Email “Will Russia 2018 be remembered as the World Cup that revolutionised fair play?”. Feedback on “Will Russia 2018 be remembered as the World Cup that revolutionised fair play?”.